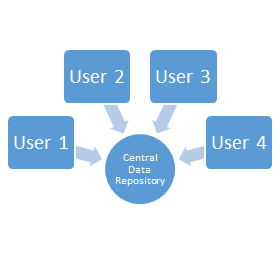 Benefits of a Central Data Repository - Teleo Inc.
A central repository is a collection of stored data from existing databases merged into one so that it may be shared, analyzed or updated throughout an organization. It is essentially created by integrating the data from all available sources. Having all information in a central location allows for the data to be easily organized, analyzed and secured. The amount of data organizations collect and store has been rapidly increasing, creating a need for more efficient ways to manage this data. The increasing complexity of data poses a threat to quality and accuracy, making integration a necessity. Erroneous data is virtually useless and even possibly harmful to an organization because if management teams are making critical decisions based on inaccurate data, the results could be costly. Decisions determine the performance of the entire organization and having access to accurate and organized data analysis allows management the ability to make effective decisions and execute quickly on a consistent basis. By making data from various sources available in one location, managers no longer need to make blind decisions. Data integration through a central repository or central database of information allows for users to make changes to the information and changes are reflected throughout the organization. This avoids having more than one set of data that requires constant synchronization. This also allows each department within the company to operate within a centralized workflow by allowing many users access to the same real time data. According to the data warehousing institute, poor data quality essentially costs businesses billions of dollars annually. Data analysis is used to examine trends and establish strategies for the business to be successful. A central repository offers trustworthy data in order to produce accurate trend analysis. This increased quality is due to the data being consistently updated as well as standardized across departmental databases. Data integration and collaboration also reduces and in most cases eliminates redundancies. The elimination of redundant information reduces the time it takes to review and make decisions leading to an increase in productivity. This enhanced collaboration throughout departments ultimately saves decision makers time, giving the company a competitive advantage. Analyzing trends in order to make informed decision is made simple because a central repository stores large amounts of past data, providing a historical intelligence aspect to decision making. The upfront investment costs of implementing a data management strategy can seem high although when poised against the costs associated with poor data quality, erroneous information, and uniformed decision making, the benefits are apparent. The data shows that companies that have implemented central data repositories have generated more revenue and saved more money than companies who have not made the investment. Because data is such a huge asset for a company, effective data quality management is critical to the success and even survival of a business. The many benefits of having a central data repository lead to better decisions, higher productivity, greater efficiency and better informed employees within an organization. Implementing a central data repository is essentially allowing an organizations business processes to operate at optimal conditions.